My family takes pumpkin carving pretty seriously – we’re not exactly creating masterpieces, but we do like to outdo each other! Over the years we have made some pretty awesome pumpkins. We’ve learned a lot and honed our skills, and I’d like to share some tips with you. 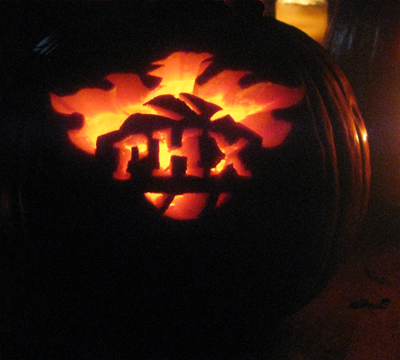 These pumpkin carving tips are for regular people who just want to make a neat pumpkin! Inspect your pumpkin. You want a flat base, a strong stem, and no soft spots or gouges. Shake the pumpkin to make sure it doesn’t sound sloshy on the inside (trust me; you do not want to cut into that!). Make sure it has at least one nice surface for carving. Practice on paper. Even with a fairly simple design, do a dry run on paper – draw it out (or print it) and cut out all the pieces that you would on the pumpkin. This creates a pumpkin carving stencil and ensures that you won’t end up with a surprise piece that has nothing to connect to. Transfer your image. Tape your stencil onto the nicest surface. I use a toothpick to lightly score my stencil onto the pumpkin. With the stencil still taped on, go through and put an “X” in each area that will be cut out completely, and some lines in the areas that will just be scraped down. Clean out your pumpkin. Cut the top off by cutting in at a 45-degree angle so that the stem will sit back in nicely and not fall into your pumpkin. Scrape out the guts with a large metal spoon. On the carving side, scrape out excess flesh – you’ll want less than one inch, but not so thin that the pumpkin will shrivel quickly or collapse. Plump your pumpkin. Soak your cleaned out pumpkin in a bucket of cold water with a bit of bleach in it for about an hour. It will absorb the water and become more plump and firm, making pumpkin carving easier; and the bleach will help prevent molding. Carve your design. Drill a hole in each area that will be removed. I like the tiny little saw that comes with the grocery store pumpkin carving kits, but the rest of the kit is pretty useless. I use a sturdy serrated knife in combination with garnishing tools, an exacto knife, and whatever else I can find in my kitchen and toolbox. Check out craft stores for pottery and linoleum tools for unique designs. Side note – dental tools work great for pumpkin carving if you have access to them, and there is something just very *Halloween* about torturing your pumpkin with these instruments! Add details. I add depth by scraping some areas away rather than cutting all the way out, giving a nice mild glow through the flesh of the pumpkin. Make sure you leave plenty of connecting areas so it doesn’t collapse on itself. Prep your pumpkin for use. Coat the exposed edges with a thin layer of petroleum jelly or vegetable oil to prevent moisture from escaping the flesh (this is what causes shriveling). I jab a few whole cloves into the underside of the lid – it turns your jack-o-lantern into an air freshener when used with a real candle! Keep your pumpkin fresh. Here in Phoenix, it stays pretty warm through October, and leaving a carved pumpkin out in the heat will lead to disappointment. I bring my pumpkins in during the day and put a plastic grocery bag around them to keep moisture in. If you have room in your fridge, keep wrapped pumpkins there when not in use. If your pumpkin starts to shrivel, soak it again in a mixture of bleach and very cold water until it plumps back up, then recoat with oil. Light your pumpkin up. I like battery powered candles because they don’t burn out, but there’s just something about the smell of a jack-o-lantern with a real flame inside! If you use a real candle, be careful that you are not creating a fire hazard. Drill a couple holes in the back of your pumpkin near the top to allow oxygen flow.